The Link is a new and interesting 3D slot that will definitely attract players with its sharp high-definition graphics and simplistic game play that despite 3 reels and 8 lines awards pretty decent payouts. The Link is based on the old game Noughts and Crosses with the addition of few other symbols. Brightly coloured 3D symbols are floating in space and they spin around their orbit whenever you hit a win. The music and the background with sparkling stars in the distance take you to a cosmic adventure that might seem minimalistic but it offers payouts up to 5000x your stake. We suggest that you stick around and find out more about the Link. Gamevy are London-based start-up that is making its way in the online gaming industry with bold creations and real-money games that aim to bring a TV-like experience. Their portfolio features game shows, lottery and bingo, while only recently they have ventured in creating slots. Even though the portfolio boasts only a small number of games they have already won a “Game to Watch” award this year at ICE Gaming. If you have ever played Noughts and Crosses or Tic Tac Toe then you know all there is to know about playing the Link. Even if you have never heard of these games you will figure out the game play in an instant. The aim of the game is to get three matching symbols in a row and they can align vertically, horizontally or diagonally. And that is all there is to it. You can set your bet size on the controls menu displayed on the right side of your screen. For additional information click the settings button on your left. The slot layout features a 3×3 grid of symbols such as Cross, Circle, Triangle, Square and Diamond. Depicted in sharp-looking 3D style, these symbols can actually award you plentifully. Diamond and the Star will be your favourite shapes in this slot as they pay up to 5000x your stake for all 8 paylines. The Square, Triangle, Circle and Cross will return your bet 4000, 3000, 2000 or 1000 times, respectively. The Star icon also acts as a Wild which means that it can replace each and every symbol of the game. When the Star appears to form the winning combination with two matching signs, it colours the signs yellow. Well this slot definitely holds some amazing payouts for only 3 reels and 8 paylines but it seems that there is something missing here. What you can notice in this intergalactic slot is that apart from the Wild symbol, there is nothing that we can call a special feature. At first this seemed strange so we checked couple of times if there was a bonus hiding somewhere behind those colourful geometric shapes, but we found nothing. So, practically the only special feature (if we can call it that way) is the appearance of the Star that is, game’s Wild symbol. At the same time, the Star pays the most and substitutes every symbol in the game. So if you are missing that third of a kind in a row the star will help you form the winning combination and turn all of the symbols golden yellow to match its colour. We cannot help but wonder how the developers allowed themselves to release such a nice-looking slot without the main attraction. This minimalistic slot actually offers pretty nice payouts across for 8 full lines. The highest paying symbols, the Star and the Diamond will return your bet 5000 times if found on 8 full lines. You will not be able to bet less than $1 while the maximum amount you can bet is $10 which is probably not enough for some players but having in mind the maximum payout, this slot can be quite profitable. Gamevy have excelled in the design department and created a visually attractive slot which also pays well, but they forgot the most important thing: the main selling feature. The slot comes with no bonus features and the only thing you can rely on is the Wilds symbol. Honestly, we don’t see this as reason enough to invest our money in this game. Surely the audio-visual experience is top-notch but that does not increase your balance. 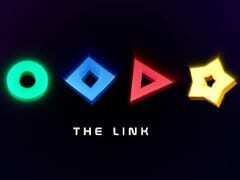 The Link is an interesting-looking slot that deserves a spin or two, and you won’t go penniless after playing it but still it simply has too little to offer.